Hey guys, are you ready to embrace fall? I know I am! With the temperature dropping, I’d say it’s time to migrate indoors and fully embrace our inner homebodies. Whether you’re binging on Netflix in fuzzy throws or entertaining friends and family in the comfort of your own home, this Dip Dye Tassel Chandelier decor piece will create a warm and festive vibe throughout this season! One simple trick to making your home feel cozy is by adding warm colors and textures. Aside from layering accessories like throws and pillows around the home, adding decor and art pieces that are made out of fabric instantly came to mind. 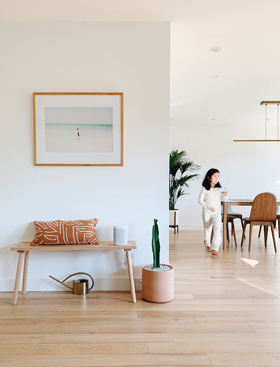 Tassel wall art is having a huge moment right now, so I enlisted some help from my creative cousin Gloria who suggested to take it one step further and make a tassel chandelier. As you can see, the result is one-of-a-kind, and dare I say, look expensive. 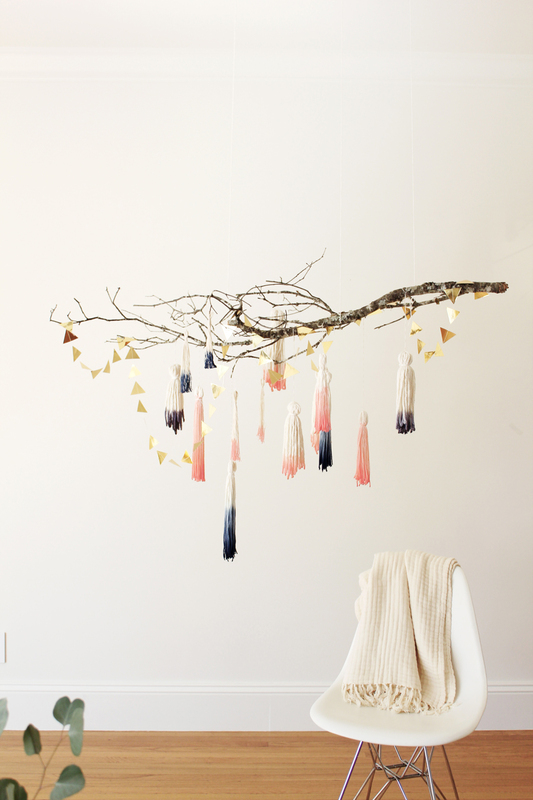 Check out below to see how we made our DIY Dip-Dye Tassel Chandelier! Cotton yarns.Since the trick is to add texture, we picked up several cotton yarns in different thickness and blends to achieve the interesting look of the chandelier. Jo-Ann Fabric offers a great selection of cotton yarns in different colors and blends. We stayed with natural cotton yarns. Books (or magazines) in small to medium sizes.This will help create different lengths when we make the tassels. Fabric dyes.This is completely optional. If you’re a neutral kinda gal, you can certainly skip this step and keep your tassels un-dye. There’s definitely beauty in keeping things natural and clean. 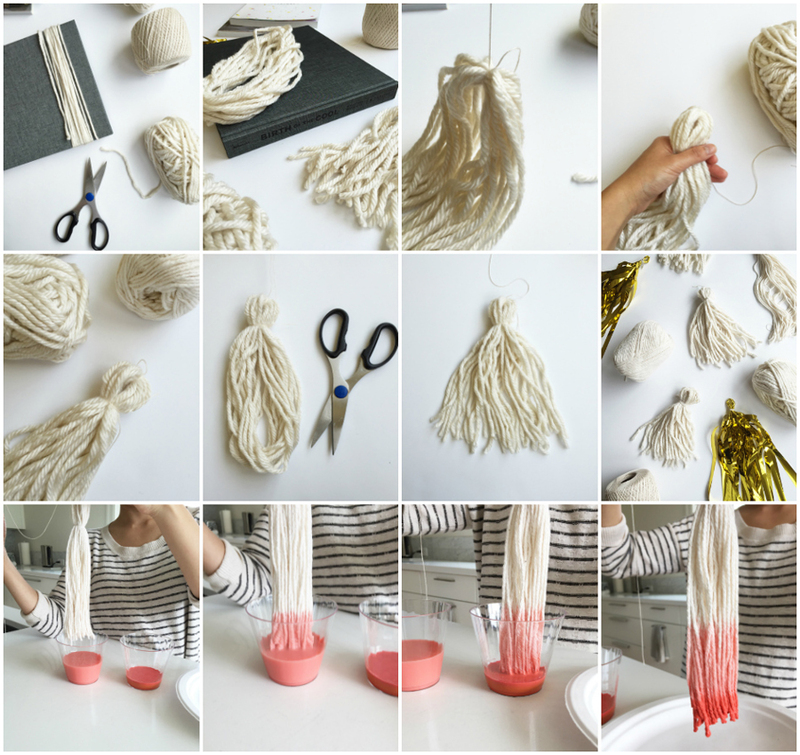 However, if color is your thing, dip-dyeing the tassels with pre-blend liquid dyes is a great option. Wood branch.Nothing speaks fall more than wood branches. Again, this adds textures to the chandelier. Not only are you bringing the outdoors in, but it will make your chandelier look way more expensive than what you spent. You can find wood branches at your local flower market (which was what we did) or you can purchase one here . Gold garland.This is also completely optional. 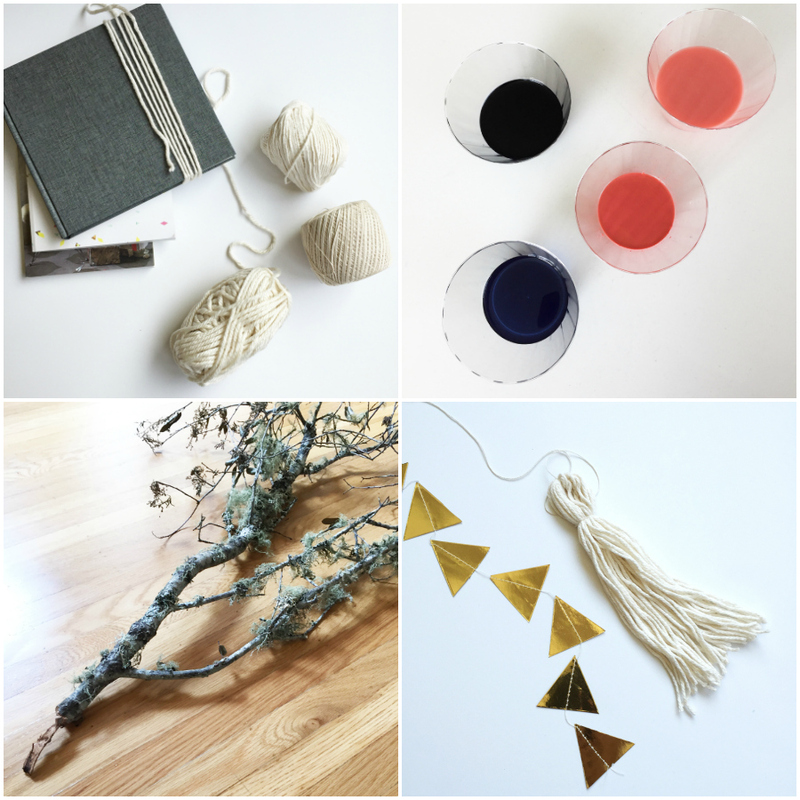 But I’m always up for adding a little bling so we draped our gold triangle garland from Harlow & Grey. Begin by wrapping the yarn around the short side of the book. Wrap until you reach a desire amount. For thicker yarn, I wrapped it around 20 times. For thinner yarn, I wrapped it around 30 times. Take the yarn out and tie a small piece of yarn through the top. This yarn will be used to hang the tassel onto the chandelier so make sure the yarn is long enough for you to adjust the height later on. Hold a small of yarn at the top and tie another piece of yarn tightly to create a loop. Center the yarn piece. At the bottom, cut straight down the center. Two tone dip-dye (optional). In cups, fill the lighter color dye higher, and fill the darker color dye lower. Dip the tassel in the lighter cup about 1-2 inches and let the dye soak up, it will run up a little higher. Let it set for a few minutes. Then dip the tassel in the darker cup in about 1/2 inch. Hang and let dry. To speed up the drying process, try using a blow-dryer in low heat mode. 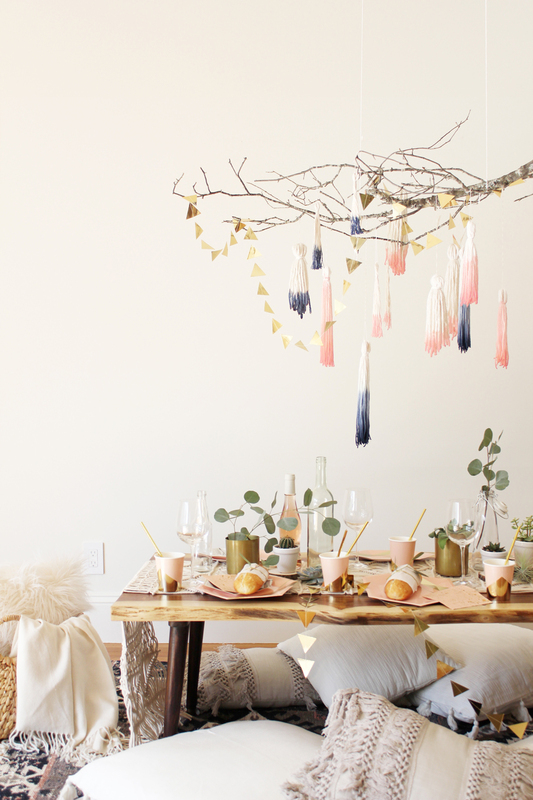 Once all the tassels are dried and ready, find a desired height to hang the wood branch. 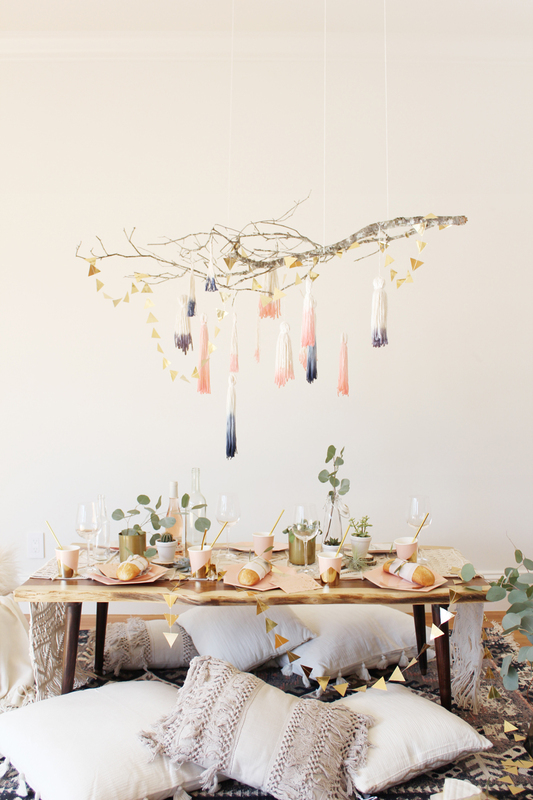 Then tie strings onto the wood branch and hang with ceiling hooks. 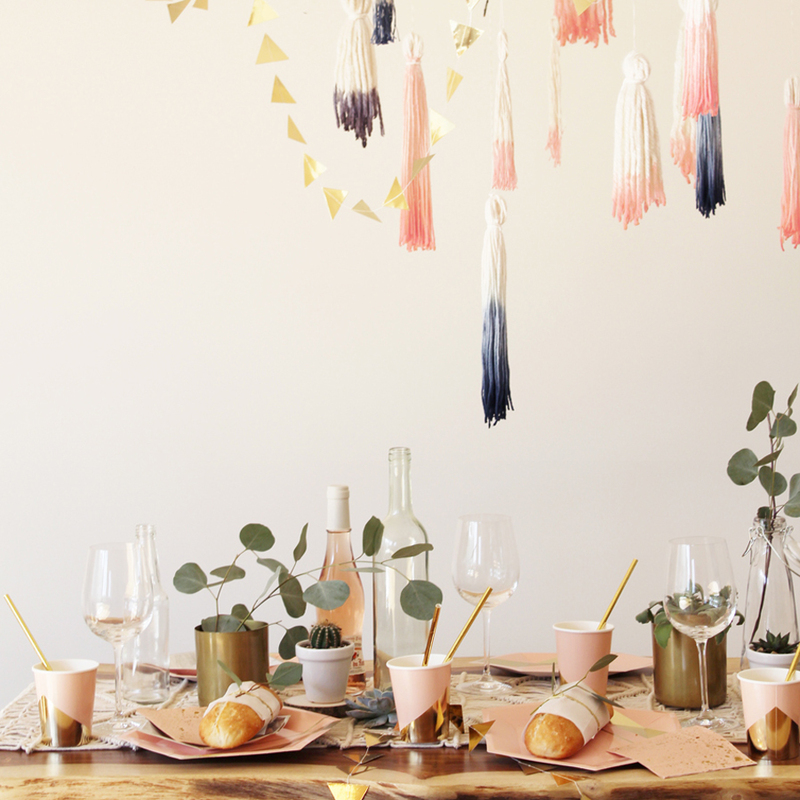 Final step, hang the tassels and gold garland as your heart desires! This post is an advertisement by Cotton. All words and opinions are my own. Thank you so much for supporting my sponsors and letting me share this unique DIY project with you! For more daily inspirations, behind-the-scenes, and instant discoveries, please follow my Instagram and Snapchat (@shopsweetthings).